Having rehearsed Israelite history from Abraham's call to the return of the Judean exiles from Babylon, we can see that—though Israel had disappointed God, and He had punished them severely—He did not cast them off completely (Romans 11:1). Not only did He retain most of Judah, Benjamin and Levi in the Promised Land to prepare the way for the Messiah and the New Testament church, He also promised to "sift the house of Israel among all nations, . . . yet not the smallest grain shall fall to the ground" (Amos 9:9). Conventional wisdom declares the house of Israel, the northern ten-tribes led by the half-tribes of Joseph, to be "lost." A recently released compact disc, Beyond the Sambatyon: The Myth of the Ten Lost Tribes, cites "evidence" of Israelite habitation or influence from Japan to the Americas to Pakistan and Nigeria. Yet in the end, its producers pooh-pooh the idea that Israelites (other than the Jews) even exist today, concluding they have either been absorbed into other nations or returned with the Jews from Babylon. If we believe God, however, we cannot accept this rather facile conclusion. "The Scripture cannot be broken" (John 10:35), says Jesus, who also says, "I was not sent except to the lost sheep of the house of Israel" (Matthew 15:24). He also sent his disciples "to the lost sheep of the house of Israel" (Matthew 10:6). Even his statement in John 10:16—"And other sheep I have which are not of this fold"—implies that He recognized that the bulk of ten-tribed Israel was not among the Jews of His day. Our Savior certainly did not think Israel had irretrievably disappeared! The apostle James, Jesus' half-brother, wrote an epistle to the Israelites about AD 60: "James, a servant of God and of the Lord Jesus Christ, to the twelve tribes which are scattered abroad: Greetings" (James 1:1). If he addressed a letter to them, he would certainly have to know where they lived to send it! "But I will bring back Israel to his habitation, and he shall feed on Carmel and Bashan; his soul shall be satisfied on Mount Ephraim and Gilead. In those days and in that time [the end time]," says the LORD, "the iniquity of Israel shall be sought, but there shall be none; and the sins of Judah, but they shall not be found; for I will pardon those whom I preserve." Then where is Israel? Under what name do the Israelites exist? Does the Bible give us any indication of their whereabouts? When the Assyrians conquered Israel and dispersed her population in the lands beyond the Euphrates (II Kings 17:6), only the house of Judah remained in the Land of Promise. Though Judah had not yet forsaken Him, God began to raise up prophets to warn the southern kingdom that she was headed for the same fate as her sister Israel. Through these prophets, particularly Isaiah, Jeremiah and Hosea, God gives us directions by which we can find where Israel lives in the last days! Remember, all the following directions must be understood from the vantage point of Jerusalem. Jeremiah 3:12: "Go and proclaim these words toward the north, and say: ‘Return, backsliding Israel,' says the LORD." Jeremiah 3:18: "In those days the house of Judah shall walk with the house of Israel, and they shall come together out of the land of the north to the land that I have given as an inheritance to your fathers." Jeremiah 31:8: "Behold, I will bring them from the north country." Hosea 11:10: "They shall walk after the Lord. He will roar like a lion. When He roars, then His sons shall come trembling from the west." Isaiah 49:12: "Surely these shall come from afar; look! Those from the north and the west. . . ."
A line stretching from Jerusalem to the northwest cuts through much of Europe from Greece to the North Sea. Where along this line should we look for Israelites? We learned earlier that the line of David would continually rule over some part of the house of Israel (Jeremiah 33:17). Psalm 89:20, 25: I have found My servant David. . . . Also I will set his hand over the seas." David's dynasty would rule over a sea power somewhere to the north and west of Jerusalem. Jeremiah 31:10: "Hear the word of the LORD, O nations, and declare it in the isles afar off, and say, ‘He who scattered Israel will gather him.'" Israel, headed by Ephraim, would inhabit islands and coastlands far from Jerusalem. This seems to eliminate any of the Mediterranean nations; they would be considered "near" to Jerusalem rather than "afar off." Now we are looking for a nation, dominating on the seas, living on islands and coastlands in the area of the North Sea. Are there any other clues? Jeremiah 31:7: "For thus says the LORD: ‘Sing with gladness for Jacob, and shout among the chief of the nations; proclaim, give praise, and say, "O LORD, save Your people, the remnant of Israel."'" Genesis 49:22: "Joseph is a fruitful bough, a fruitful bough by a well; his branches run over the wall." Isaiah 49:20: "The children you will have, after you have lost the others, will say again in your ears, ‘The place is too small for me; give me a place where I may dwell.'" These verses hint very strongly at colonization of other lands because of burgeoning population and prosperity. Though many nations have colonized other lands in the past, only the nations of northwestern Europe have done it to a great extent. Do any nations fit all these criteria? Only one: Britain! We should be able to find Israelites, primarily of the half-tribes of Joseph, the birthright tribes, in Britain. EDINBURGH, SCOTLAND (AP) - With prayers, pipers and some political nuance, the legendary Stone of Scone was placed in its new home in Scotland on Saturday [November 16, 1996], seven centuries after it was stolen by an English king. . . . Prince Andrew represented his mother, Queen Elizabeth II, at the ceremonies on the feast day of St. Andrew, Scotland's patron saint. 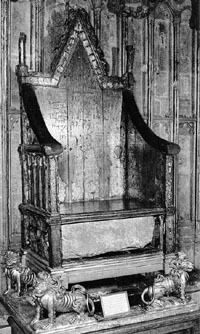 The rough-hewn block of gray sandstone, weighing 458 pounds, was the coronation seat of Scottish kings until it was carried away as war booty by King Edward I in 1296. The Stone of Scone (pronounced "skoon") was placed under the coronation chair in Westminster Abbey, where it has been involved in all coronations since. The stone will be placed on public view in Edinburgh Castle. Legend says that the stone originated in the Holy Land, and that the biblical patriarch Jacob rested his head on it when he had his dream of a ladder reaching to heaven. One would think that if millions of Israelite refugees migrated from their places of captivity in northern Mesopotamia, some evidence would remain to show their passage. This is indeed the case! Literally dozens of pieces of information comprise a jigsaw puzzle that shows the passage of Israel from the Middle East to northwestern Europe. God Himself told Ephraim to mark their way so that they could return one day to the Promised Land: "Set up signposts, make landmarks; set your heart toward the highway, the way in which you went. Turn back, O virgin of Israel, turn back to these your cities" (Jeremiah 31:21). How were they to do this? One of the main ways involves the prophecy of Jacob about the tribe of Dan. "Dan shall be a serpent by the way, a viper by the path" (Genesis 49:17). A serpent or snake leaves a mark behind it as it moves over the earth; some snakes, like rattlesnakes, leave very distinctive trails. So does the tribe of Dan. Though Joshua had allotted land to Dan in Canaan, the Danites found it to be difficult to hold and settle because of its proximity to the Philistines. They began to look elsewhere for living space. Finally, they came to the city of Laish, in the far northern reaches of Israel, and they took it. "And they called the name of the city Dan, after the name of Dan their father, who was born to Israel. However the name of the city was formerly Laish" (verse 29). And thus they have been naming places after their ancestor ever since! A good map of Europe will show dozens of place names carrying the name of Dan within them. The Don, Dnieper, Dniester and Danube rivers all flow into the Black Sea. The Romans knew the Rhine and Rhone rivers as the Eridanus and the Rhodanus. Denmark (literally, "Dan's Land") and Sweden are both northwestern European countries. The English escaped from Dunkirk (literally, "Dan's Church") during WWII. One can find similar place names sprinkled heavily throughout England, Scotland and especially Ireland, where dun means "judge," just as dan does in Hebrew! A Lot in a Name! In Scripture God obviously puts a great deal of stock in names. He changed Abram's name to "Abraham" for a reason; He did the same by renaming Jacob to "Israel." The reason is that He names things what they are. He named His Son "Jesus" because He is Savior! As we have seen with Dan, his name is significant in tracing the steps of migratory Israel after their captivity. Genesis contains two significant prophecies about the name of the Israelite peoples that we must address. In the first, Genesis 21:12, God tells Abraham to send Ishmael and his mother away, "for in Isaac your seed shall be called." Paul repeats this twice in the New Testament (Romans 9:7; Hebrews 11:18). On the surface this seems to mean that God would consider Isaac's progeny to be the true sons of Abraham, and this is true. But it means so much more! It also means that Israel would call itself by the name "Isaac" in later times. Sharon Turner, author of History of the Anglo-Saxons, agrees, "Saka-Suna or the Sons of Sakai abbreviated into Saksun, which is the same sound as Saxon, seems a reasonable etymology of the word ‘Saxon'" (p. 87). It takes no great leap of reason to conclude that "Saxons" is a corrupted form of "Isaac's sons." These are just a few of the biblical proofs of the location of "lost" Israel today. We lack space to explain such proofs as Jacob's Pillar Stone, the "overturns," Jeremiah's commission, the whereabouts of David's dynasty, the journeys of Christ's apostles, the end-time fulfillment of the birthright promise, the 2,520 years prophecy and many others. Much more evidence—of historical, linguistic, cultural and even physiological natures—exists in other sources currently available.